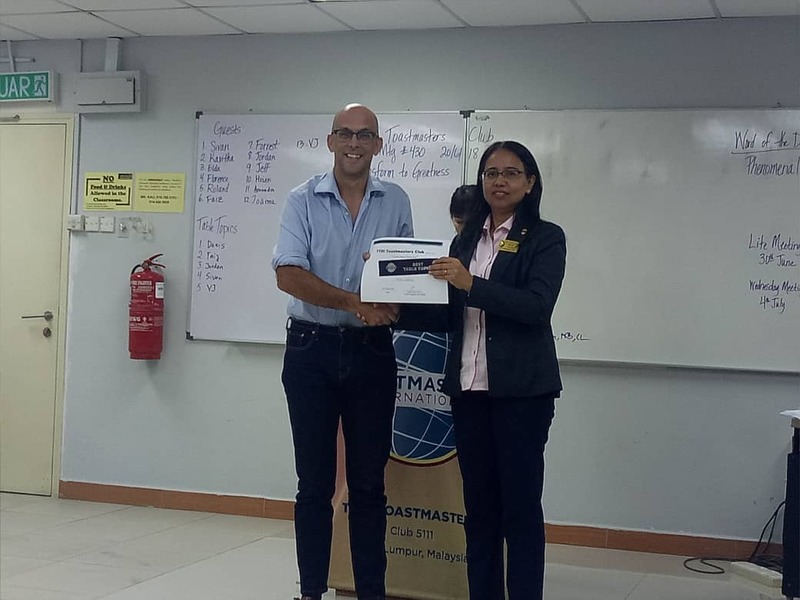 I started going to Toastmasters as few months ago to improve my public speaking skills. On Wednesday I won my first table topics contest. Table topics is when you are given a random topic to speak on for two minutes with no preparation. In this case I was given the title of “Transform into Greatness”. Every journey, every ambition that we have starts with a single decision. Unless we make that decision we cannot change or start the journey to achieve our potential. In this we are like a caterpillar. We go through life happily munching on our daily concerns. We have no really worries apart from our immediate circumstances. OUr focus, our sphere of interest is narrow. We may be excited by a slightly larger or a slightly greener leaf. Our horizons are limited – we cannot see even as far as the horizon. The human response is to withdraw into a cocoon. To the outerworld it looks as if we have withdrawn. It looks like we have put the hard shell of the chrysalis as a barrier between us and the world that hurts so much. In reality the shell gives us space to think, reflect and understand. I wish I knew how long a transformation took. I wish I knew how to predict it’s length. Alas when I am in the grips of one it goes at it ‘s own pace. My ego, in all its anger cannot haste or delay it. Eventually though a day comes when the cocoon splits. We emerge naked and vulnerable into the world again. It’s different now as we see it with jewelled eyes and iridescent wings. The horizon is clear and we can dance crazily along forest paths seeking our destiny. As we transform into a butterfly the way that we see the world shifts. It is this new frame of being that allows our transformation into greatness. It is a journey that we can all make. We must all make. In the course of our lives we will feel the urge to withdraw away from the world and start a new transformation. This is a good and important thing. It is a wonderful part of being human.